The solution, according to economists, activists and many in the design community, is to get smarter about both the design and disposal of materials, and shift responsibility away from local governments and into the hands of manufacturers. Because most people dispose of used aluminum, paper, plastic and glass in the same way — throw them into a bin and forget about them — it’s easy to think that all recycled materials are created equal. But this couldn’t be further from the truth. Each material has a unique value, determined by the rarity of the virgin resource and the price the recycled material fetches on the commodity market. The recycling process for each also requires a different amount of water and energy and comes with a unique (and sometimes hefty) carbon footprint. All of this suggests it makes more sense to recycle some materials than others from an economic and environmental standpoint. A recent study by Kinnaman provides research to back up that assertion. Using Japan as his test case — because the country makes available all of its municipal cost data for recycling — Kinnaman evaluated the cost of recycling each material, the energy and emissions involved in recycling, and various benefits (including simply feeling good about doing something believed to have an environmental or social benefit). He came to the controversial conclusion that an optimal recycling rate in most countries would probably be around 10 percent of goods. Kinnaman’s assertions about plastic and glass have to do with the cost and resources required to recycle those materials versus the cost and availability of virgin materials. But he’s not without his critics, particularly on the plastics front, given that he describes the environmental impact of making virgin plastic as “minimal,” a conclusion based more on the emissions and energy required to recycle plastic than the fact that the stuff persists in the environment forever. Still, Kinnaman’s point — that we need to be choosier about what we recycle — has resonated with environmentalists and waste management experts alike. We may also need to find a way to decouple recycling from the commodities market. What’s happening with plastics right now is a good example of why. In the eastern U.S., to cite just one example, prices for recycled PET plastic fell from 20 cents a pound in 2014 to less than 10 cents a pound earlier this year, while recycled HDPE prices dipped from just under 40 cents a pound in 2014 to just over 30 cents per pound today. That’s thanks to a confluence of factors: Oil prices have dropped from US$120 in 2008 to less than US$35 a barrel today; growth in the Chinese recycled goods market dropped from its typical steady, double-digit annual growth to 7 percent in 2015; and the dollar is strong, which makes American recycled materials more expensive than their European or Canadian counterparts. Powell adds that changing technologies can also play a role in determining what does or does not make sense from a recycling standpoint. Recycled plastic, for example, was largely used in carpeting 15 years ago, but these days more of it is making its way back into beverage bottles. If Not Recycling, Then What? That type of “closed loop” thinking is where solutions to today’s recycling woes tend to be focused. Extended producer responsibility, or EPR, laws for packaging would require manufacturers to take back the plastic, cardboard and form-fitting foam their products come in, ideally with the purpose of recycling and reusing it in future packaging. Such policies essentially assign manufacturers the task of collecting and processing the recyclable packaging materials they produce. 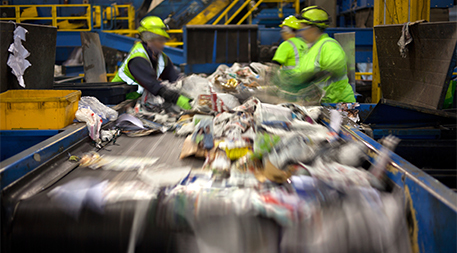 Companies can set up any sort of recycling system they want — they can continue to fund curbside pickup and pay a recycler to process the material, or they can switch to some sort of drop-off method and opt to do the recycling in-house — the only stipulation being that they have some sort of a take-back and recycling program in place. EPR not only lets local governments off the hook for paying for recycling, but also effectively divorces recyclable materials from the commodities market: Companies could opt to sell the recycled material they collect and generate, but they would also have another use for the materials (producing more packaging for their own stuff) should the commodities market crash. Currently, several European countries — including Belgium, Germany, the United Kingdom and Ireland — have EPR laws, as do Australia and Japan. In Canada, the province of British Columbia has province-wide EPR laws, while Ontario EPR laws cover about 50 percent of disposable goods. Germany’s EPR laws for packaging have been in place the longest (since 1991) and offer the clearest picture of the impact these laws have on waste management. According to an in-depth case study of Germany’s EPR system conducted by the Organisation for Economic Co-operation and Development, the country’s EPR laws were credited with reducing the total volume of packaging produced in the country by more than 1 million metric tons (1.1 million tons) from 1992 to 1998 alone, representing a per capita reduction of 15 kilograms (33 pounds). The overall market showed a noticeable shift away from plastics as well, with a reduction in total volume from 40 to 27 percent. 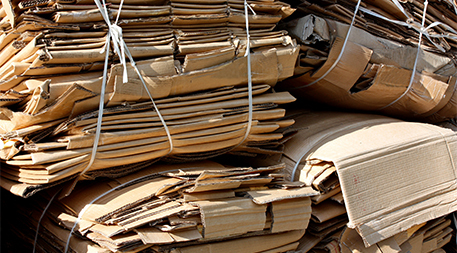 Germany is one of the European Union’s top recyclers, with 62 percent of all packaging being recycled. Efforts to pass EPR laws for packaging in 2013 in Minnesota, North Carolina and Rhode Island met with opposition from the consumer packaged goods industry. But, according to Matt Prindiville, executive director of the nonprofit UPSTREAM (formerly the Product Policy Institute), which has long led the charge for packaging EPR laws in the U.S., the current commodities crash in recycling is making EPR more attractive to local governments. Meanwhile, according to a 2012 report from the nonprofit As You Sow foundation, some US$11.4 billion worth of valuable PET, aluminum and other potentially useful packaging materials are being landfilled each year. A more recent report, published this year by the World Economic Forum and Ellen MacArthur Foundation, finds that 95 percent of the value of plastic packaging material alone, worth US$80–120 billion annually, is lost to the economy. While Kinnaman makes the case that landfilling those materials doesn’t cost as much as once thought, it’s hard not to see those materials as wasted if they’re just sitting in a hole in the ground. 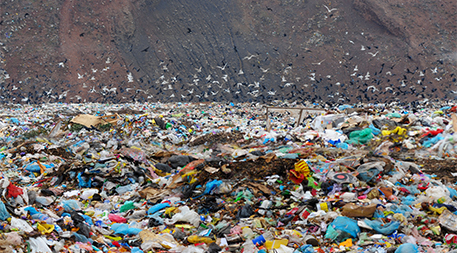 Plus, the MacArthur Foundation report points out that plastic packaging generates negative externalities for companies, such as potential reputational and regulatory risks, valued conservatively by the United Nations Environment Programme at US$40 billion. “Given projected growth in consumption, in a business-as-usual scenario, by 2050 oceans are expected to contain more plastics than fish (by weight), and the entire plastics industry will consume 20% of total oil production, and 15% of the annual carbon budget,” the news release accompanying the MacArthur Foundation report states. That’s precisely why some countries — Sweden, for example — have come back around to the idea of incinerating garbage now that technology has evolved to reduce emissions from incinerators. Thirty-two garbage incinerators in Sweden now produce heat for 810,000 households and electricity for 250,000 homes. It’s when companies also see the value in these materials that things will really change.The U.S. plastics industry has been pushing for a similar strategy for dealing with plastic waste — particularly the latest class of thinner, lightweight plastics that don’t fit into existing recycling streams — but critics note that burning plastic still emits toxic chemicals. Instead, Prindiville says he’d like to see the U.S. work toward building a circular economy, as many European countries are trying to do. “Forward-looking CEOs are really drilling down and questioning what is the role of these materials? What’s the role of packaging? And how do we ensure a cradle-to-cradle loop instead of wasting resources?” he says. 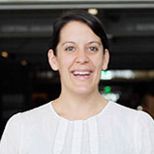 Bridgett Luther, founder of the Cradle to Cradle Products Innovation Institute, says that while legislation might help, it’s when companies also see the value in these materials that things will really change. Toward that end, some companies have already created their own take-back programs, motivated by innovation and market forces rather than regulation. Luther points to the carpet industry as an example, with companies such as Shaw Floors and Interface routinely taking their carpet back to recycle it into new carpet. In the beverage industry, Coca-Cola made a commitment to use 25 percent recycled plastic in its bottles by 2015, a number it had to downgrade due to high cost and short supply of recycled material. Walmart is in a similar situation, currently struggling to find the supply to meet its goal of using 3 billion pounds (1 billion kilograms) of recycled plastic in packaging by 2020. Globalization means more packaging to throw away. Relocalization means we can use traditional re-usable packages. Or even no package at all. Yes, EPR is a necessary component of a balanced approach to keeping stuff (especially problem materials) out of landfills. But this article's conclusions are negated by its failure to discuss the economic distortions caused by federal policies that subsidize virgin resource extraction. The author should take a look at petroleum and timber depletion allowances in the tax code and at the Mining Act of 1872, which basically gives away minerals found on federal lands, then see how the story changes. So far as market conditions being a factor--recyclables are commodities whose prices fluctuate in response to economic forces. No one should be making policy decisions on whether or not to recycle something based solely on today's market prices, whether high or low. Much more important issues are at stake. I do not disagree with the final conclusion or at least statement of this article, “The ultimate solution, … is better design of products and packaging further upstream to plan better for end of life and avoid the waste issue altogether.” We cannot recycle our way to zero waste and the benefits economically and environmentally that accrues from it but we also cannot get to zero waste without recycling. It is a key part not the only element as recently misrepresented. I find it unprofessional that Ensia would publish this article with some very blatant misinformation. You don’t have to look harder than the first paragraph which states, when speaking about current recycling in the US “…even the most ardent of recycling fans questioning the current system.” The link, as an example of the “ardent recycling fan,” takes you to a recent John Tierney New York Times op-ed titled, "The Reign of Recycling" where Tierney shares his view, "The recycling movement is floundering, and its survival depends on continual subsidies, sermons and policing." This is building off his 1996 article "Recycling is Garbage," calling recycling "a waste of time and money, a waste of human and natural resources," setting an all-time record for hate mail at the New York Times Magazine. Well maybe you can’t blame Tierney he has been waiting almost 20 years for some evidence that he was right way back in 1996. Supposedly, the other ardent fan of recycling Tierney quotes in his recent article, the CEO of Waste Management (WMX), has finally given Tierney what he would call “proof.” Tierney was probably doing back flips and the author of this article just copied his moves. She also basically rewrites Tierney’s article, apparently having done little research of her own to see if any of their claims are actually true. The author then goes on to use the same studies by Thomas Kinnaman, an economist professor from a very small Baptist College in Pennsylvania, that Tierney used. Not surprisingly, Kinnaman uses his own previous studies to support his data in his more recent study. The data he uses isn’t even from the US it is self-admittedly from Japan – because supposedly the US does not have adequate data. Even he admits that his “… provocative results certainly require confirmation from future independent and objective research before broad policy goals can be adjusted.” But the author in the Ensia article fails to include that information and the editor of Ensia failed to do their work to confirm from independent and objective research if this article was worthy of publishing. An important situation to note when discussing the plastics market, it that oil prices have dropped significantly in the past few years. This change in the price of a barrel of oil is a direct impact on the demand of recycled resins. Susan, it seems as though you may not have read past the first section. I state very clearly that Kinnaman's research is based on data from Japan, note that his research is not without its issues, point out some of those issues (the fact that he claims there is "little environmental impact" to using virgin plastic, for example, is quite far from the truth), and note that in fact demand for recycle plastic remains high. Moreover, the bulk of this story is based on my own research into commodity markets and their impact on recycling, not Kinnaman or Tierney's take on things. And the conclusion is not that recycling is bad, but that in order for it to truly deliver environmental benefits, it needs to be decoupled from commodity markets, and probably taken off the shoulders of municipal governments that don't have the money to pay for it. I have been researching and reporting on this particular issue -- how commodity markets impact recycling and the impact that in turn has on the environmental impact of recycling -- since 2007, and have a massive folder of data to prove it. Every time commodity prices for recycled materials dip, recyclers shut down, cities pull recycling programs, and recyclable materials get landfilled. That is something multiple recyclers have told me over the years, and did so again for this article. This article and the study by Kinnaman appear to leave out any Climate Change cost of plastic from extraction of feedstocks, manufacture and disposal. Also left out are all the health impacts from extraction, manufacture and disposal, as well as health impacts from plastic to food contact. The real point should be that current plastics recycling is a failure economically, socially and environmentally and therefore fossil-based plastic should be eliminated from the marketplace. There's nothing circular about incineration as a solution to garbage. It takes largely petrochemical based garbage and burns it, releasing persistent bioaccumulative toxins into the environment. It is ever bit as linear as landfilling, except we are putting a more highly concentrated form of waste into the biosphere and ultimately our bodies, instead of in holes in the ground. Susan - Bucknell is not a "small Baptist college in Pennsylvania." I suggest you Google it to get your facts straight. I'm just glad we're having this discussion as it is clear that better alternatives are needed to nudge us closer to a more sustainable way of living. Thanks Amy for your passion and commitment to this fascinating subject. I live in Cabarrus county, NC, just north of Charlotte. The cost of new landfill space in this area is extremely high. There is huge resistance to the siting of new landfills, as well as the cost of lining, and treatment of leachate from new fills. The two legacy landfills in the county are nearing capacity, and are not lined, as it was not required at their commissioning in the 1970s. The major benefit of recycling to this county is the extension of landfill life. I hate to consider what will happen when these two fill up. Mecklenburg county, which contains Charlotte, had such trouble sighting a landfill in the northern part of the county, it exports trash to one of our landfills here, in Cabarrus. I've been considering the problem for some time, and have some ideas. 1) Limit packaging of dry products to wood pulp based materials, aluminum, and polyethylene films. 2) Limit liquid, and wet food packaging to aluminum containers, and standard size, and shape, glass bottles, and jars, which are designed to make cleaning, and reuse easily automated. I would use the classic wide mouthed, square bodied quart, and half gallon "Mason" jar design as two of the standards, although I might make them one, and two liter. These reusable bottles would carry deposits mandated by law to encourage returns, and intentional breakage. Product differentiation would be done by paper labeling, and the labels would be attached by adhesives designed to release in hot water, during the bottle washing process. Any business that sold products in these containers would be required to accept any used containers up to 200% of the previous months sales, by weight of containers. These recommendations are based on the high value, and ease of reuse of aluminum, the history of reuse of glass containers, and the cost savings made possible by automation of cleaning them, and the biodegradability, and possibility of using wood pulp based materials as fuel. I would also require trash removal services, both municipal, and private enterprise to bill their clients on the basis of weight of trash disposed. I would guarantee the right to compost, and grow fruits and vegetables on their property as a way of diverting food scraps from the waste stream. Susan is right about this article being written by WMX and funded by the glorious Koch's. So much nonsense in so few paragraphs. It's not worth the time to rebutt, other than on incineration and landfills. Incineration is used on what can't be recycled but pollutes the air with dioxins, etc. A solution in Europe and Japan for the non-recyclables only is pyrolysis where the molecules are broken down at 1,500+ degrees into a synthetic gas that is then run through a turbine to generate electricity. Our city recycling center works just fine even in this lousy commodity market and our garbage rates are a lot less that WMX or Republic. But, getting garbage rates higher for WMX is likely the purpose for this article. The "ultimate" solution is one that recycles ALL trash back into its constituent elements, firstly removing some of the biomass to be put back into the ground (biochar?). Plasma incineration is needed but "costs" a lot of energy. Dangerous toxics, metals, glass, everything will be broken down by super high temps once energy collection and storage become cheaper (global grid powered primarily by solar and solid state batteries?). The only things ALL the people should have to recycle is the biomass in that future. Also right now, like NOT throwing away the leaves and pine needles! We still should recycle all the energy intensive stuff like aluminum cans because we're still using "dirty" electricity (otherwise, it wouldn't matter much since aluminum is common). By plasma incineration, I mean far less (or no) smoke into the air and to have filters condensing the vapor from elements heated to many thousands of degrees. It is absurd to think that the end user (and even the manufactures) could even come close to like 90% turn around of most garbage. Only a centralized plasma incinerator placed as needed could recycle 99.9%. Laws could then state "Throw all toxins in trash, do not leave in yard" (including all those disgusting old cadmium solar light AA batteries). I wonder how many don't get "properly thrown away" over the course of decades? Billions? In the meantime, it would be nice to have a waste collection system that minimizes the toxins and the plastics that are definitely getting into every nick and cranny of the biosphere. Also wanted to say, Thanks for the good artical! I didn't realize how recycling should be decoupled from commodity markets until I read this. I guess we're still a long time away from plasma gasification. Just wanted to respond to Susan Hubbard, who has healthy skepticism about this article, but mischaracterizes Bucknell. It's small, but it's still a university, and a rather good one. It has Baptist roots, but it's not a Baptist school. Hallelujah!!! Finally some honest dialogue about reality from the Head-in-the-Heaven but Feet-in-the-Mud crowd. Keep up the good "factual" research work. Recycling-ly yours, ANS, the GodFather of Recycling. In a world that is rapidly falling apart due to global warming, putting all living beings (including humans) in danger of extinction (not necessarily in the distant future, but at any moment), environmental considerations need to take precedence in our thinking. Even if recycling is more energy efficient than extraction of raw materials, it is still polluting. We need to think of making recycling a truly clean option, by using electric (photovoltaic) vehicles to transport wastes, and clean, alternative energies to power the recycling machines and processes. The same thinking needs to be applied to incinerators or any waste disposal process - we need to be careful about their environmental and health impacts, which are one and the same.